Combat among bucks vying for positions in the breeding hierarchy are quite dynamic and loud...and can get deadly. Antler rattling, a deadly effective skill that can be learned and used by any hunter. Ensconced under an umbrella-shaped huisache tree, I could see outward, but my outline was one with the trunk of the tree and all the precariously drooping branches that literally touched the ground. Within moments of getting situated, I began to orchestrate a mock battle of two bucks in an attempt to attract a buck to within viewing distance with my rattling antlers. Following a few low, guttural grunts from my deer call, I began scraping and tearing my antlers against the closest tree limbs, proceeded by a minute of light rubbing of the antler pair I held in my hands. With no immediate response, I remained in position, stealthily moving my head from side to side, monitoring my surroundings. After approximately five minutes, I extended my antlers into the bending branches, most of which had been winterkilled, and began tearing them apart with the antlers, intermittently clashing the antlers themselves together. Unaware of my surroundings and totally involved with my mock battle, I looked up to see a 160-class, 10-point buck facing me only 20 paces away. Confused, the dark-caped South Texas deer remained focused on my performance until I stopped and made eye contact. He whirled and disappeared instantly, only to return following another brush popping, antler-clashing series to verify he hadn’t made a mistake in locating the would-be combatants. If I had so desired, I could have easily dispatched the animal on his return, but he wasn’t what I was looking for, so the trigger was pulled on my camera instead of my rifle. Rattling in whitetailed bucks is a most enjoyable, exciting, and more importantly, productive way of pursuing those elusive apparitions of our fields and forests. It is even more alluring when one realizes that anyone can do it. Like any technique, horn “antler” rattling is something we all can improve on, and experience is the best teacher. Obviously, there are certain procedures to follow to enhance one’s success, and there are some things you definitely wish to avoid in order to increase your chances of bringing in that trophy-racked buck. Concealment may very well be the essential ingredient to success. Like the buck I instantly brought in, I was unaware he was present until it was too late, at least initially. However, without his ability to make out my outline, I was granted a second opportunity to look him over. More times than not, sportsmen will totally depend on camouflage clothing and position themselves in an area too open for proper concealment. That’s why I like to locate my rattling position in an area inundated by cover, allowing narrow windows of viewing opportunity in every direction, with excellent concealment for myself. The huisache trees of South Texas, particularly those with low-hanging dead branches, offer prime concealment for the hunter. Not only do I employ the branches to eclipse my outline, but my movement as well, because I oftentimes move around to tear up brush, including the drooping branches, with the antlers. Obvious movement is a mortal sin to the antler rattler, for deer are unforgiving once motion is detected. A buck approaching upwind of a mock battle will fail to detect human scent, but will key in on any movement. Thus, proper concealment, “you can’t have too much,” is critical if you want additional time to analyze that rack, especially on savvy, mature bucks that have rushed into mock battles in the past. Another critical element to rattling success is patience. I have often witnessed hunters standing up prematurely while the buck remains in view – particularly when it is a young buck. This is a big mistake. Imitating a battle between fighting bucks requires the hunter to do some serious brush popping in conjunction with rattling of the antlers. First of all, the young, naive bucks will come in first, hoping to intercept the potential doe left alone by the adult gladiators. But the thing to remember is that the adults, particularly those in the trophy rack-producing ages of five and six, are not always in a hurry. They are totally aware of their hierarchal position and know they can subordinate those youngsters at their leisure. Their modus operandi is to allow those young bucks to jump in and verify a “coast is clear” situation. Their approach time is slow initially, but can be accelerated once other bucks begin entering into the picture. A hunter rising too early could spook away a trophy of a lifetime and never even realize it. I recommend remaining in the same position for at least 30 minutes following the departure of a buck, while conducting a rattling sequence once every five to seven minutes. Another problem with changing position within sight of a deer is what I refer to as the educational factor. Bucks do have some memory retention, and it only makes them more difficult to rattle up in the future when their antlers are generally more attractive. The ultimate advantage for anyone attempting to rattle up a whitetail is elevation — use it to your advantage. This is especially effective when hunting with a partner. An ideal way perform the strategy is to position yourself in a tripod upwind from your partner, who should be rattling on the ground. By conducting experiments in such a fashion, I have found the individual in the tripod would see three bucks for every single buck the rattler would observe. For those solitary hunters, elevation remains extremely effective. Rattling from taller trees or even out of deer blinds is the rule here. For instance, this past Christmas Eve morning, I found myself hunting from a deer blind some 12 feet up, overlooking a large expanse of brush and a small oat patch. I had spotted, quite by accident, a fine buck with a doe at the patch the evening before and hoped to see him again. The predawn hours were accompanied by intense rain, which gradually receded into the early hours of the morning. Deer movement was zero this particular morning, so I decided to rattle. By carefully handling my pair of rattling horns outside the window, the loud clashes could, I hoped, be heard at a distance. Almost instantly, several bucks, “nice bucks but no keepers,” appeared. My second series of rattling proved otherwise as the buck I spotted the night before came rushing out, following several other bucks, to the sounds of the battle. The 25 2/8-inch wide, 11-point buck, scoring 166 gross Boone and Crockett points, made no hesitation coming in my direction, allowing me the privilege of observing every move he made. If I was on the ground, the ample number of other respondents would surely have figured me out, and quite possibly, would have never allowed me a chance to see such a fine specimen, alone collect him. The bottom line is elevation is a key ingredient to hunting big whitetails, particularly when it comes to rattling. Another great deer I had the privilege of taking was rattled up in 1991. Positioned some 15 feet above a Suburban in a vertical tower, I had my good friend, Jeff Stringer, rattling below me in the brush and at times from on top of the vehicle. Elevation is a critical component to rattling success. This buck responded to my rattling sequence while I was stationed within a deer blind 12 feet above the ground. Upon the completion of each rattling session, we changed positions, finally arriving at a heavily-vegetated whitebrush thicket with a break in the cover some 50 yards out. Within seconds of the first rattling sequence, I signaled for Jeff to continue rattling because I had spotted a large buck negotiating the thicket towards us, moving within 25 yards of our vehicle, which was pulled into the thicket. Unaware of what I was observing, Jeff’s rattling sequence was interrupted by the bark of my 7mm. The 170-class buck plummeted to the ground, allowing Jeff to view the tremendous buck only after we were standing over him admiring his antlers. Without proper elevation, there was no possible way I would ever have seen this animal. That’s where homework comes in. Hopefully, you will locate a place in which those cherished big bucks thrive. 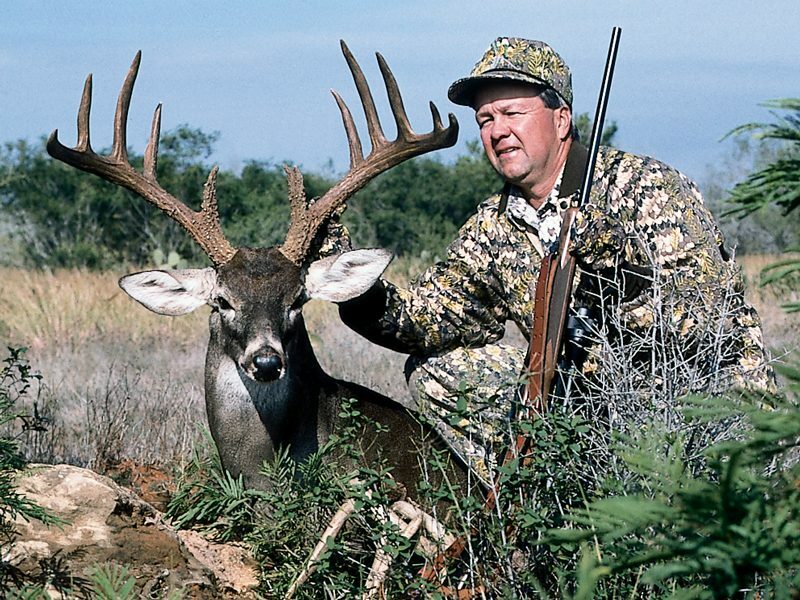 Here in Texas where most land is private, some access fee is required to hunt certain areas. For the most part, you get what you pay for, and fees can be quite exorbitant. The antler-rattling technique is as unique as the individuals employing it. Like I stated, it can and does work for everyone, but like dry fly-fishing for big rainbows, you don’t get a rise on every cast, and at times, you must match the hatch. In other words, experience will tell you where and when to rattle. I stick to short, light rattling sequences initially, in case deer are in close, but will end up by loud thrashing of both the antlers and the brush. Oftentimes, the louder a sequence is, the more attractive it is to the deer; however, only experience will assist you in your methods. Rattling up white-tailed deer is the most attractive attribute deer hunting has to offer. It puts the hunt back into the hunt. The most unique thing is there is no age limit on the employer of the technique. It can work for everyone. So, give it a try this season. You may add a new dimension to your deer hunting repertoire, and possibly tag that big one you’ve always dreamed about!